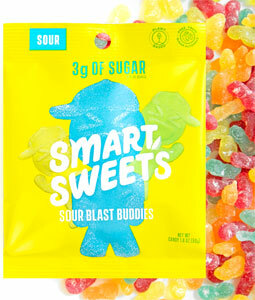 Kick the sugar aside while still enjoying amazingly delicious gummy candies with Smart Sweets! These chewy treats are full of amazing fruit flavor and each package has only 3 grams of sugar - how do they do it? 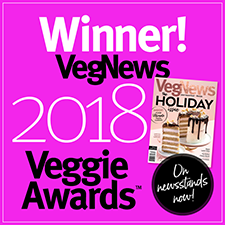 With a combination of awesome vegan ingredients including prebiotic soluble fiber that helps give the perfect texture and flavor without sugar OR sugar alcohols, making them perfect for those who have stomach sensitivities to most sugar-free candies. With a whopping 28 grams of fiber per package and a taste and texture nearly indistinguishable from Sour Patch Kids® candies, and only 80 calories in total per package, you won't find any better way to enjoy classic candy flavors in vegan form without any guilt! 1.8 oz. 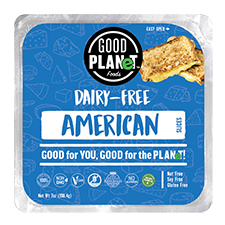 (50g) package is $3.59.